Eggs are always a quick and easy thing to prepare. Cool or warm weather, these little fellas are easily adaptable to what ever your taste buds fancy. For warmer weather or an easy lunch try and egg salad. Dictated by what’s in season, what’s in the fridge and pretty much what you fancy eating. In a baking dish add some tomato passata or left over pasta sauce. This one was a eggplant and zucchini pasta sauce. Make some slight hollows and crack the eggs in. Bake at 200 until golden. If you like your eggs still runny, bake until just the whites are cooked. Serve with some crusty bread. This entry was posted in Food Glorious Food, Making, Creating + Frugal Living and tagged baked eggs, boiled eggs, cheap meals, easy, egg salad, eggs, frugal, Frugal Living, quick, simple by cityhippyfarmgirl. Bookmark the permalink. The egg salad looks seriously perfect! Great post. both look fantastic brydie..you have turned humble ingredients into masterpieces.. I also like baked eggs in a polenta cup with a shaving of a nice hard cheese on top. Mmm! Looks like Friday’s frugal meal for us tomorrow, too! It makes me want to hide some of our eggs in the fridge so I can boil them (fresh eggs don’t boil well.) I’ve never had them baked, but it looks like something I’d like over some nice sourdough bread. eggplants and zucchini pasta sauce? interesting. recipe?? will copy the baked eggs thingy very soon. 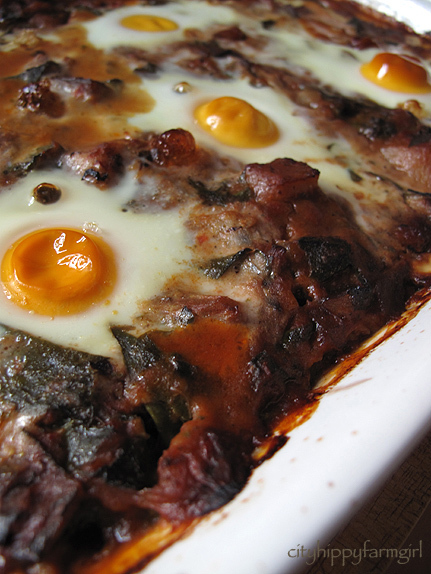 Baked eggs are so wonderful! Great post. I’ve never had baked eggs, which is a shame as I think I would have liked them. I don’t really eat them anymore, but when I did it was fairly infrequent and soft boiled was my favourite variety. I cannot go 2 days without having eggs one way or another. Great recipes. Yum!!!! I can’t wait to try these. I will be back in my own kitchen soon. Yummy looking salad – I don’t think you’re a fan of anchovies but they’re good with eggs too. I love baked eggs! I’ve not had it in ages thanks for the reminder! Frugal indeed especially when they come from your own hens 🙂 I really love your frugal Friday posts. Ooh. Egg salad. Lunch. Ooh. Yeah. I’ve always been afraid of trying to bake eggs.Then again, I was also afraid of sourdough starter and you cured me of that. So baked eggs it is!